After reading your notes from Hawaii, with various underwater images, I felt it was time to send you some of mine. Underwater photography is even harder than surface photography, and I find there are usually better photographers on most trips/boats I’m on (but they don’t send you any images!). Anyway, I’d just about finished weeding through pix from my last trip, with some minor editing (all I’m capable of) when it was time to head off for the next one. I’m relying on google to find Latin names. Comments on animal behavior are anecdotal and based on personal experience for the most part. 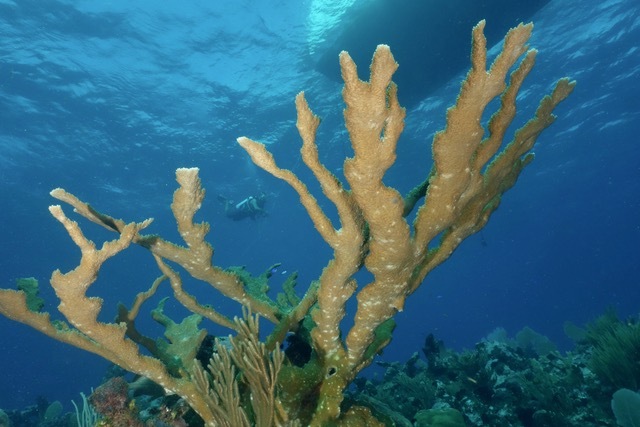 Last fall I visited Cayman Brac (one of the 2 smaller islands) for the first time, although I’d been to Little Cayman 20+ years ago, and Grand Cayman about 15 years ago. My overall impression was that the reefs were in pretty good shape, with minimal/no coral “bleaching” and good fish life despite the scourge of invasive Lionfish. 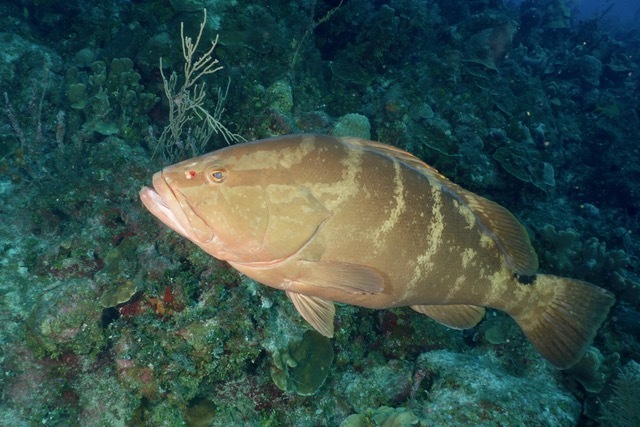 On most dives, there were one or more Nassau Groupers, Epinephelus striatus, hanging around, and even coming toward the divers. They didn’t seem to be waiting for us to scare up snacks (although I’ve seen that in the past on night dives, when our lights illuminated potential prey), and in fact appeared to want to be petted or stroked. Why? Helping clean them? 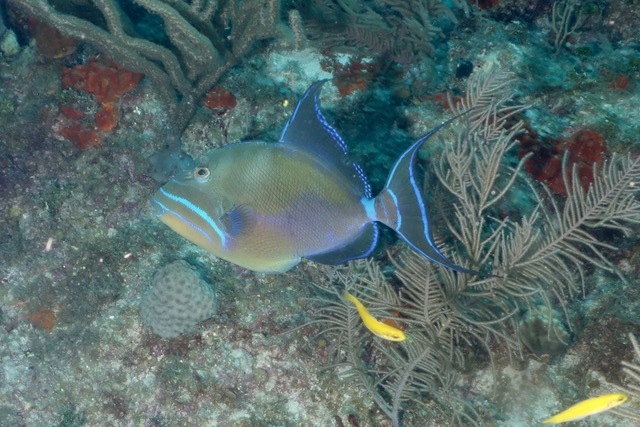 (They often go to “cleaning stations” where tiny fish will pick through their mouths or scales, presumably for parasites.) Or do they just enjoy it? I was reluctant to take part, because, hey, you’re not supposed to touch the wildlife, but sometimes they were insistent. Most were 2-4 ft. in length. 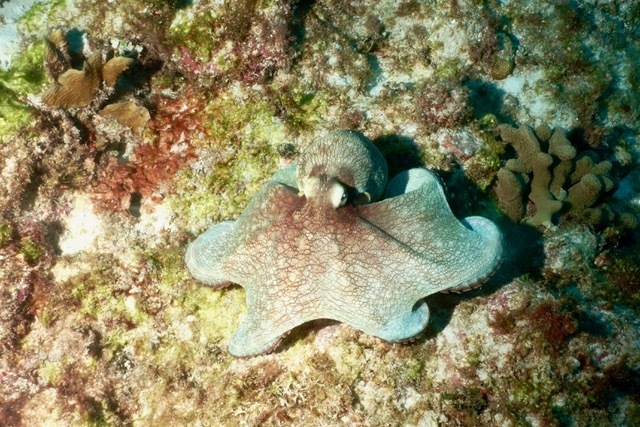 This octopus, presumably a Caribbean Reef Octopus, Octopus briareus, was out in the open in broad daylight, somewhat unusual, as they’re mostly nocturnal hunters and should be wary of lurking groupers, for whom they’d be a good meal. Their rapid color changes are quite impressive. 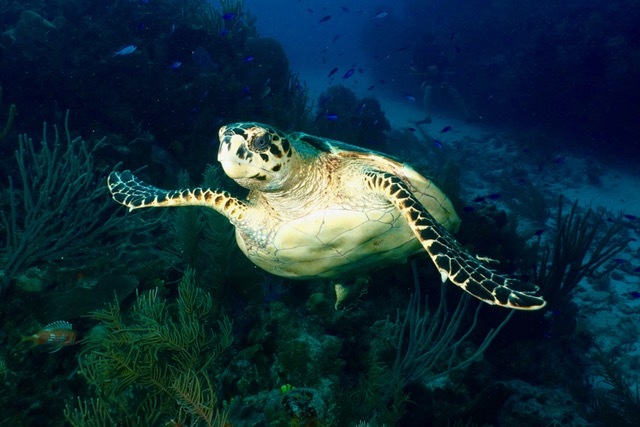 This entry was written by whyevolutionistrue and posted on February 5, 2019 at 7:30 am and filed under fish and marine creatures, invertebrates, molluscs, photography. Bookmark the permalink. Follow any comments here with the RSS feed for this post. Both comments and trackbacks are currently closed. How would mindfulness meditation work in this location? Depending on situation, being weightless (neutral buoyancy)and calm can put you in a very relaxed state, hearing only your bubbles (unless you’re on a re-breather, which I ‘d like to try sometime, although many more risks involved), or you briefly hold your breath and hear the parrotfish teeth scraping the coral, the grunts grunting, or shrimp snapping. No good images, but we saw a reef shark or two lurking about on several dives; they weren’t threatening. Nurse sharks also, staying quite still as usual (although I have some video from elsewhere showing some incredibly active and aggressive feeding behavior at night; the difference was like, well, night and day). Contrary to popular belief, sharks almost never attack divers. Shark cages, from what I’ve seen are used by film crews with over-stimulated sharks). They rarely attack swimmers in surf, and that is likely because they can’t tell, in the froth and foam, what they are attacking. I have encountered sharks on dozens of dives and never felt threatened( well, once I felt threatened, but it turned out to be embarrassingly unjustified. In that instance a large school of hammerheads passed over me on their way, presumably, to attack a fish ball). Right. Scratch the shark cage. Try a wet suit and hood. An extremely special installment of wildlife photos. Thank you for sharing those! 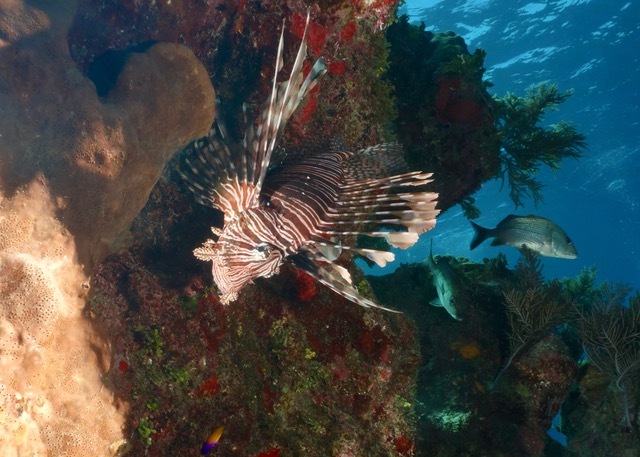 The lion fish. A Pacific species now well installed in our Atlantic coastal areas thanks to the pet trade and then idiots who just let them go. Erg. Thanks. Looking at the bigger picture, I imagine that many species (especially those we’ve made extinct) might view H. sapiens as the most invasive species ever. Yeah, and the particular lion fish in Carl’s photo looks like it’s about to gobble up a lovely Royal Gramma Basslet. Not cool! Wonderful images Carl. You are right. underwater photography is much more difficult. One of my heroes is Sue Scott, a British biologist, diver and photographer. She takes it to the extreme by filming and imaging at night. She was featured on BBC Winterwatch in 2015. Captivating experience. Thanks for sharing those wonderful images. These are lovely photos. Apparently groupers do like to be petted — and have a tooth brushing https://www.straitstimes.com/asia/se-asia/grouper-in-japan-aquarium-likes-being-petted-and-having-teeth-brushed-by-keeper. 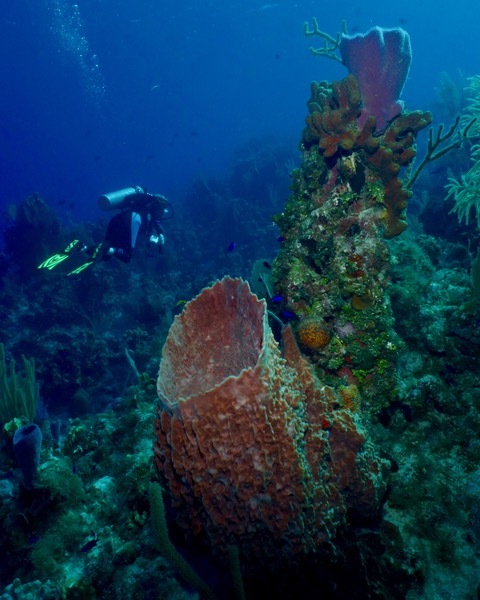 I dove in Cayman Brac years ago and was simply thrilled by the quality of the reefs and fish-life. Thanks for contributing these shots. Good memories. Thanks for these Carl. And please “weed through” some more of your underwater photos. These are a rare and welcome treat on RWP. I submitted some a number of years ago, but they were of some old reef aquariums I kept. Easy to photograph!